The latest industry buzzword, viewability, has implications for every member of the online advertising ecosystem. What does it mean, how it should be measured and what’s in store for the future are questions that are top of mind for advertisers, publishers and media vendors alike. 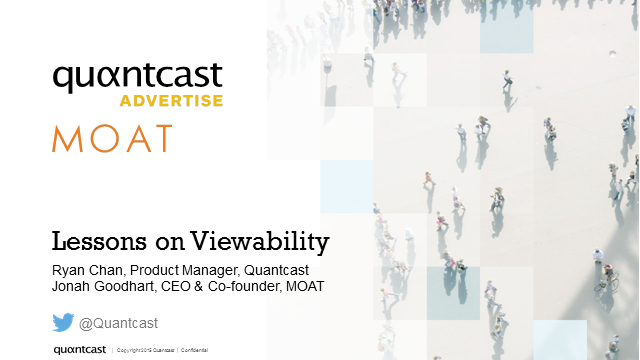 In this webinar, Ryan Chan, Product Manager at Quantcast and Jonah Goodhart, CEO of Moat, will seek to answer these questions, while presenting lessons learned from conducting tests on the current state of viewability standards. Every marketer looks for ways to optimize their marketing tactics, and reaching new audiences is top of mind for those that are looking to grow their business. Prospecting methods have evolved over time but with the availability of data and technology today, marketers have more power than ever to find their ideal customers online. Retargeting is effective, but feeding the top of the funnel with new potential customers is just as critical for continued success. Heather will discuss the importance of prospecting for full funnel marketing and how to achieve the best results with programmatic buying. Michael will also share how the organization uses real-time bidding (RTB) to find new audiences. We live in an inherently multi-touch world. Digital advertising increasingly allows us to measure every online touch point we have with our customers, leads and prospects. As a modern marketer, that's information you can use to inform your future media plans. Join this session and learn how to make the most of your display budget by using your data to attribute successes to the right tactics, channels and actions.